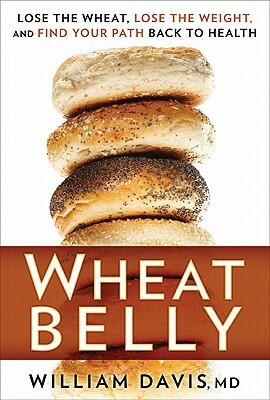 We’ve all heard of the Atkins Diet, California Diet, and the Mediterranean Diet: now make way for the Wheat Belly Diet. Eminent cardiologist Dr. William Davis believes the world’s most popular grain is the most destructive dietary ingredient on the market today. As well as gaining a wheatbelly when it is eaten, there is hardly an organ that is not damaged by eating it. Bread and other foods made from wheat have sustained humans for centuries. However, the wheat that is harvested today is nothing like the original grain. Today there are over 25,000 varieties, most of them coming from the laboratory. So intent were the geneticists on increasing wheat yields to ease world hunger, no animal or human safety testing was ever carried out on the new genetic strains. Dr. Davis links the health problems of North Americans from fatigue, arthritis, IBS and obesity to wheat addiction. Patients following his diet have seen both health improvements and “flop over the belly fat” vanish. They also reported improved mood, fewer mood swings, better concentration and deeper sleep within days to weeks of their last bagel, doughnut or baked lasagna. Many case studies in the book profile patients who initially had serious health problems, who all seemed to recover once they ventured down the wheat free path. The basics he lists are to eliminate wheat products (either cold turkey or gradually) and replace them with vegetables, raw nuts, healthy meats, eggs, cheeses, (fruit and dairy products in small quantities), plus good oils such as virgin olive or coconut oil. He suggests filling up on a larger portion of baked chicken, green beans, scrambled eggs, or salad. He includes lots of recipes to try out, which you will need to get you started. If you really want to get serious about getting wheat out of your diet, the Wheat Belly Cookbook is just the ticket for you. The first section describes his theories on eliminating wheat, in which he freely admits that going without wheat can be downright frightening. The main section is then devoted to all the recipes you will ever need: smoothies, soups, mains, salads and desserts to replace wheat with healthy alternatives. ← The Off Balance Dragon Boat Team!